Looking sourthward out of the Zócalo in Mexico City’s historic center. 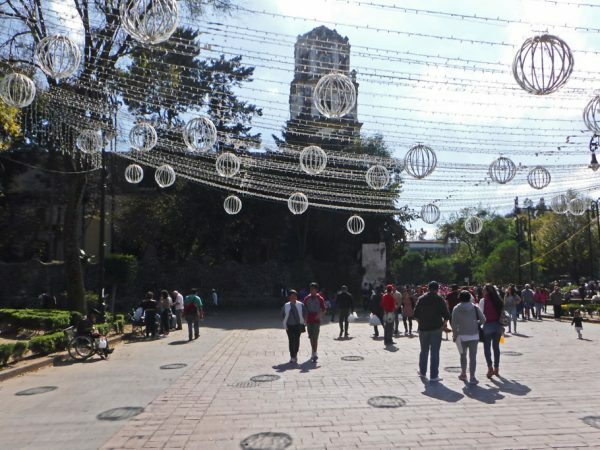 México City is the ultimate Pueblo Mágico. Take all the churches, plazas, parks, fountains, museums, mercados, colors, street performers, monuments, historic buildings, ancient ruins, art, and food from all the other Pueblo Magicos and multiple them multiple times and you have México City. I can’t even imagine how many weeks, months, years it would take to see it all. During the two weeks we spent in the city we hardly made a dent. We might have skipped Mexico City entirely except that our friend, Wayne, wanted to meet us there. It was quite a search to find an Airbnb that had off street parking that could accommodate the van but I managed it. And although it wasn’t in one of the trendier neighborhoods it was in walking distance from a couple of them and right around the corner from a Subway station that took us everywhere else. Mexico City life, as is most of Mexico that we have seen, is a life lived outdoors. People eat, shop, and relax along the busy thoroughfares and in the city’s many neighborhood parks. 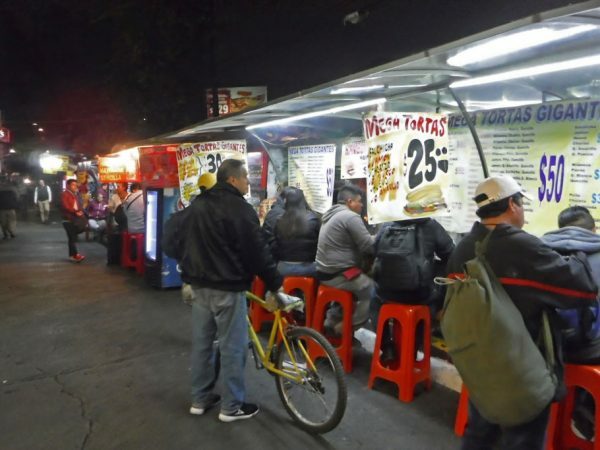 Shops with roll-up garage doors line the sidewalks, there seem to be food stands on almost every corner, in every park, and lining every street especially as you exit the subway. 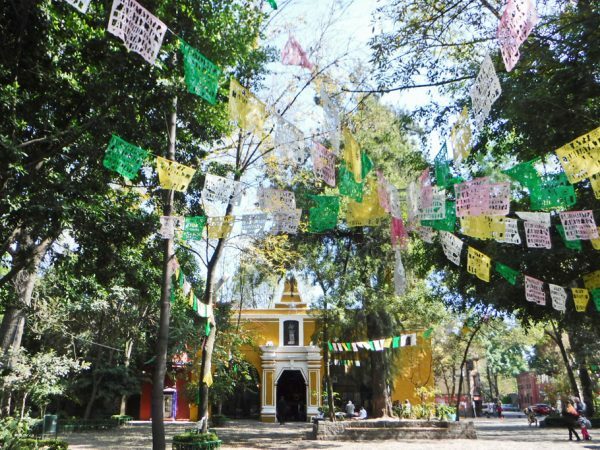 Even many of the museums we visited had an outdoor courtyard of some sort or an area where natural light streamed in from rooftop windows. We probably could have spent our whole two weeks without ever entering a museum or a restaurant and still have had an amazing México City experience. And underneath all of this outdoor life is a web of tunnels with a life of its own that connects all the many parts of this huge city. 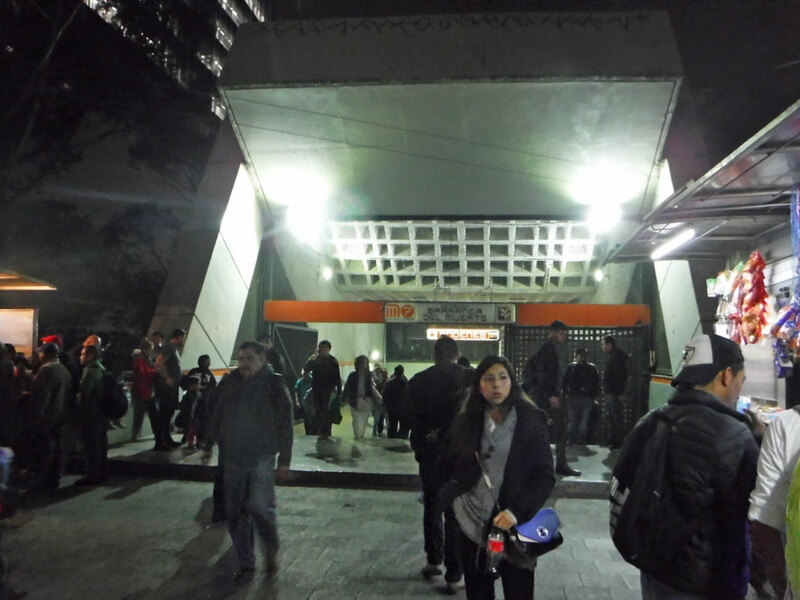 The Mexico City Metro is amazingly easy to figure out, amazingly cheap (5 pesos, about .25¢ a ride), and amazingly efficient. I don’t know if the trains run on time, but they run often. And in the underground, like everywhere else in the city, somebody is always selling something. 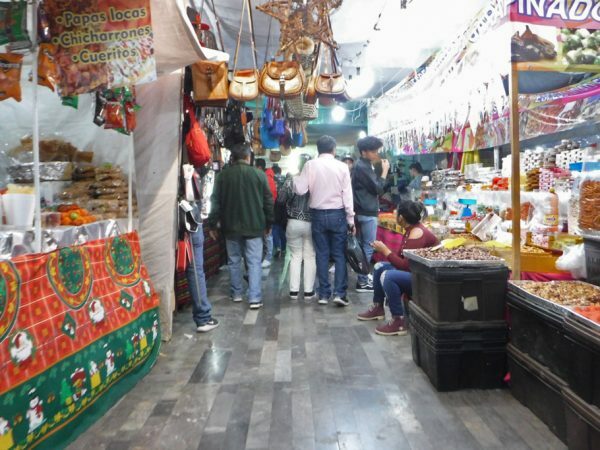 You don’t need a grocery store checkout line for your impulse buys here. Every car of the subway has a hawker who walks the length of the car for one stop, singing out in a repeating rhythmic cadence about what they are selling and the price, before getting off and hopping on another car. Need a charger for your cell phone, some candy, a straight razor? – it’s for sale on the subway. The subway is always busy, but even more so at rush hour. After you squeeze yourself into a packed train and think not another soul more will fit, five more press in at the next stop. 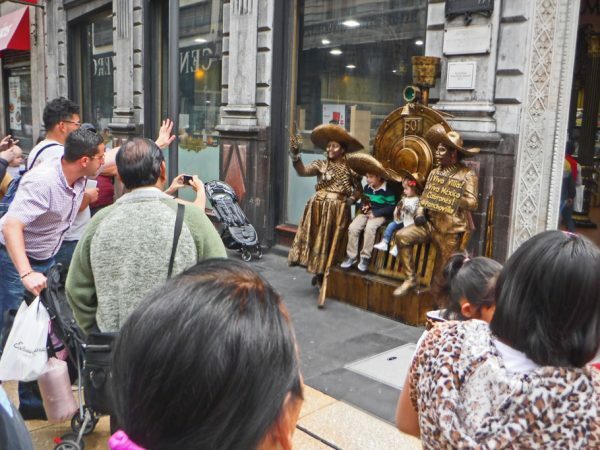 And although the subway is primarily a means of getting from one place to another there is also art, displays about the universe, a museum about the subway, pizza stands (Miss that Dominos Pizza from the US – it’s here in the Metro), donuts, and sometimes a clothing store. 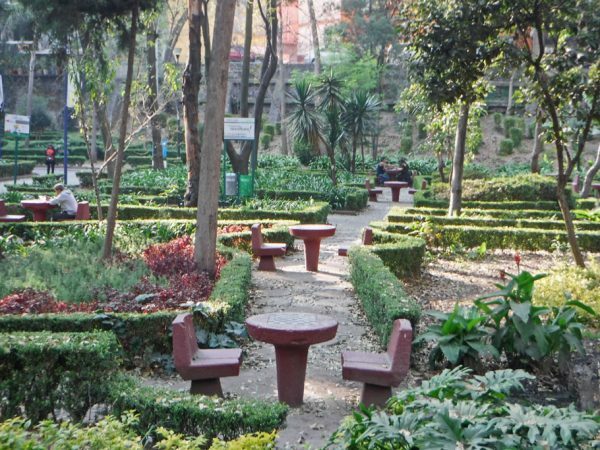 This is the first of our Mexico City posts. 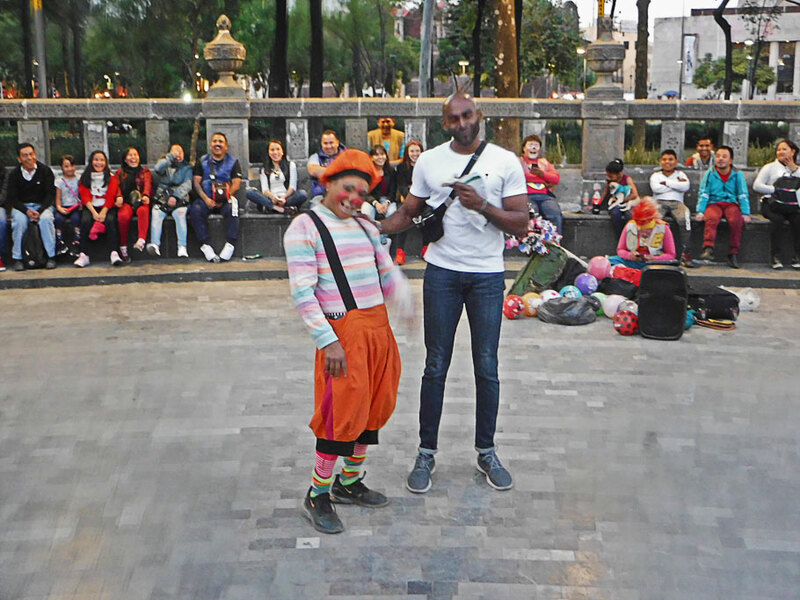 We are going to break out of our usual linear flow and instead break up our stay in the city into Themes – Ancient Ruins, Art, Food, Other Fun, and a Wrap-up post and special edition of The Cost of Being a Nomad in Mexico City. 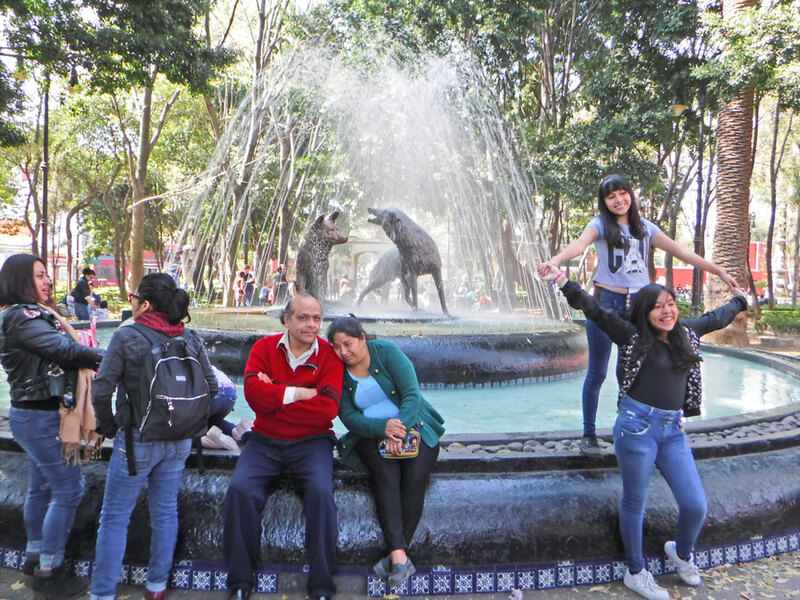 Fuente de Los Coyotes in the Coyoacán neighborhood. 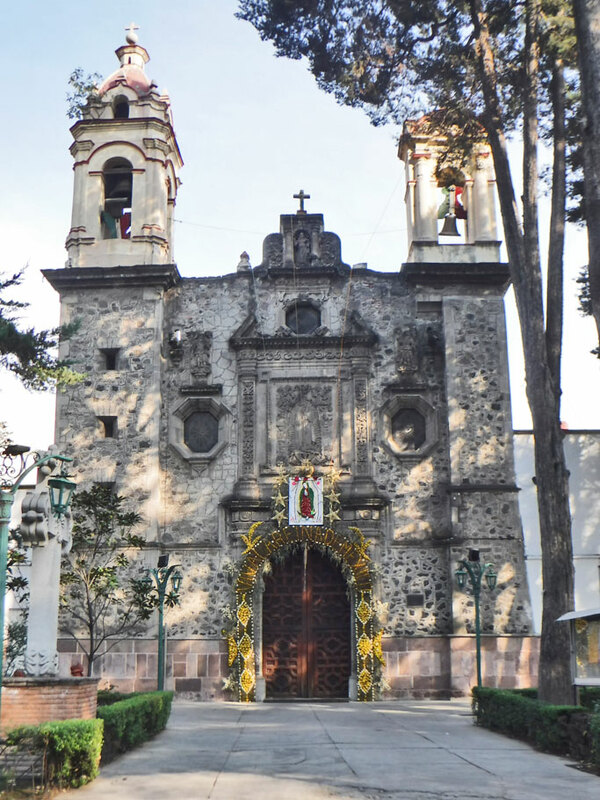 This was in walking distance from where we stayed. What to do with dead trees that need to be cut down, make art out of them. Duwan at Viveros de Coyoacán. Plaza in front of Rectoría de Santo Domingo de Guzmán. Clown Comedians are big favorites in the parks. 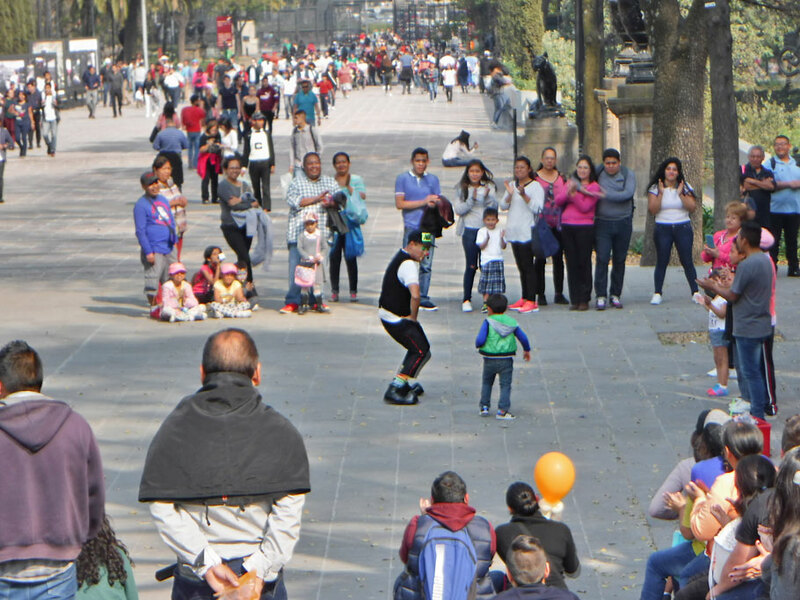 They love to draw someone out of a crowd. One tried to engage Greg with “Hey, Papa Noel, you speak Spanish?! ?” After that Greg stayed far out on the sidelines. 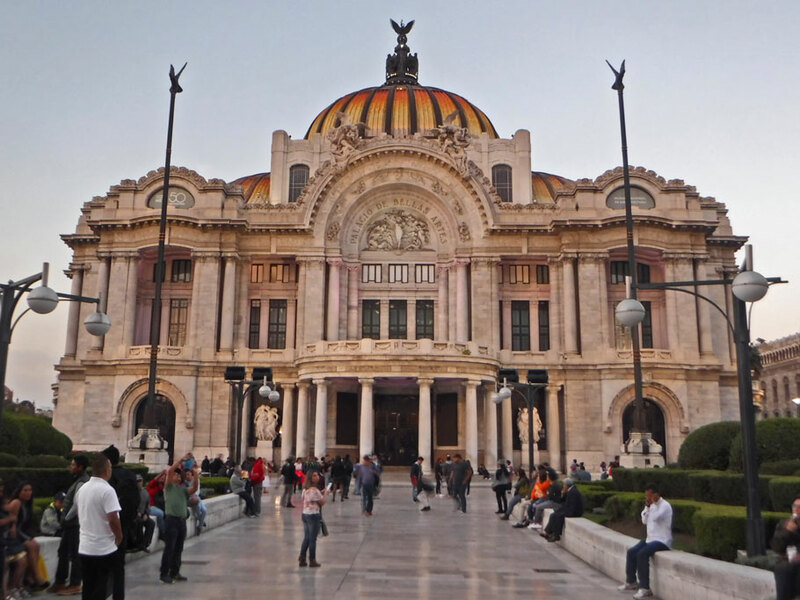 Exterior of the Palacio de Belle Artes. 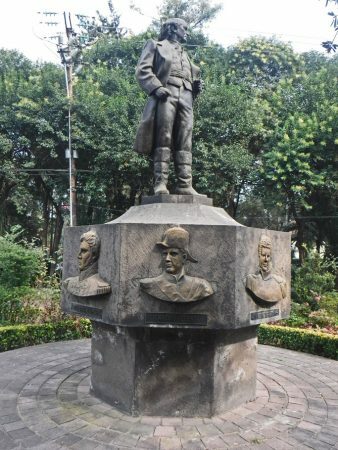 Get your pic made with bronze revolutionaries. 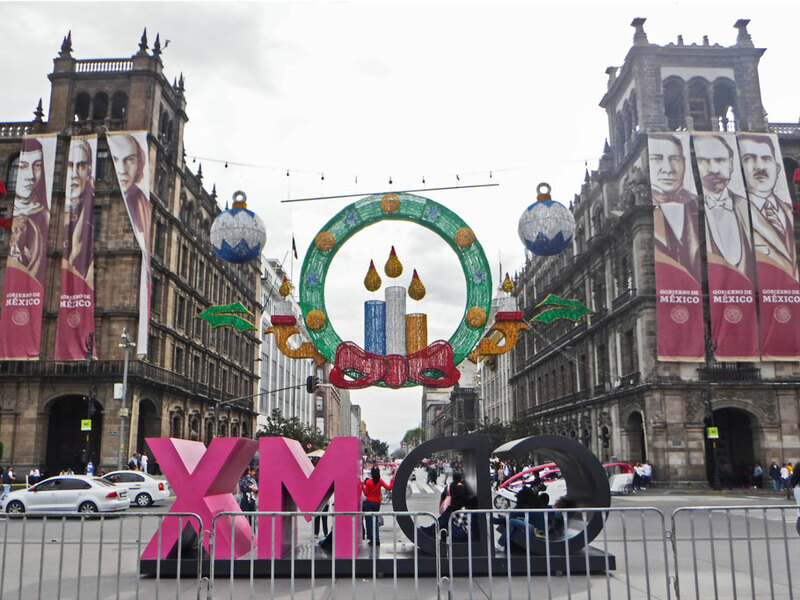 Panorama of the Zócalo in Mexico City’s historic center with Catedral Metropolitano in the background on the right. 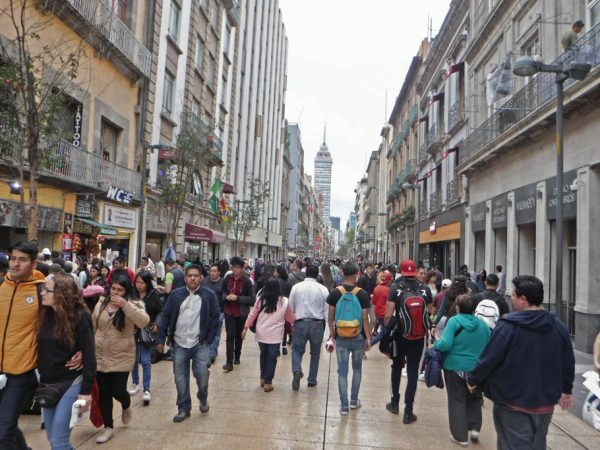 Paseo leading west from the Zócalo in the central historic district. 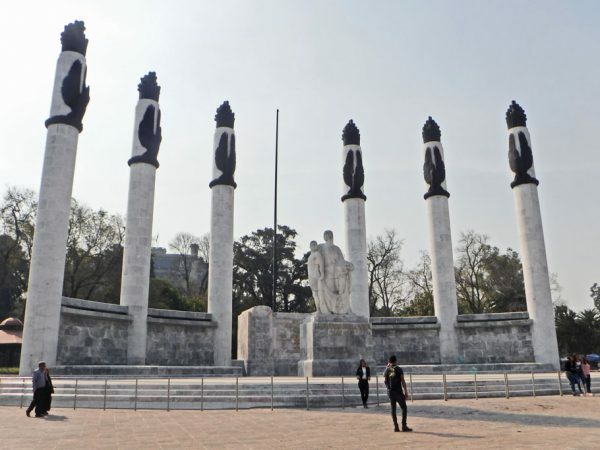 Statue dedicated of heroes of the Revolution. It’s found in Parque de la Bola. 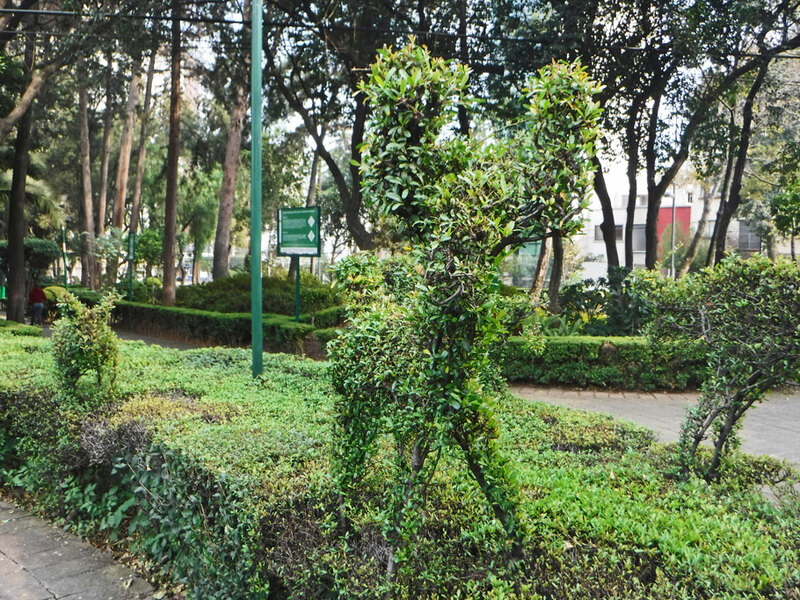 Topiaries in Parque de la Bola, which is really just a well appointed traffic roundabout. 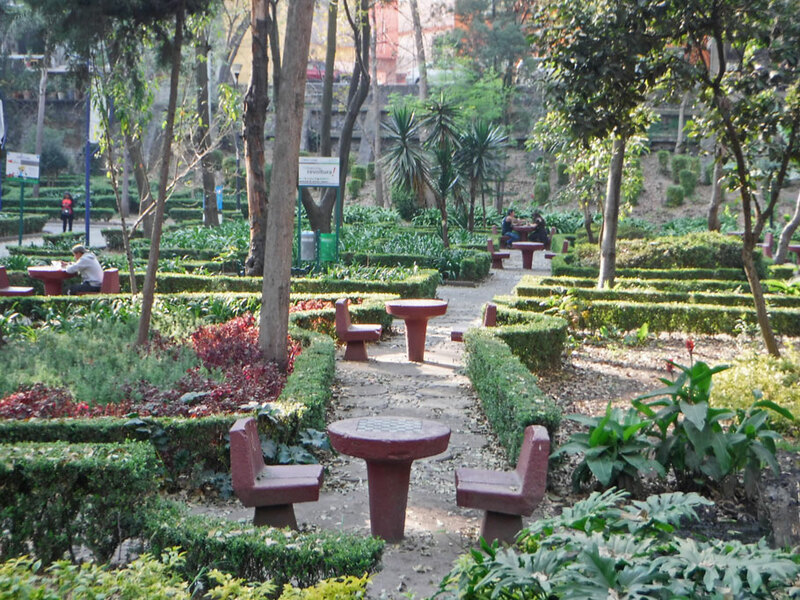 Chess/checker tables in Parque Hundido. 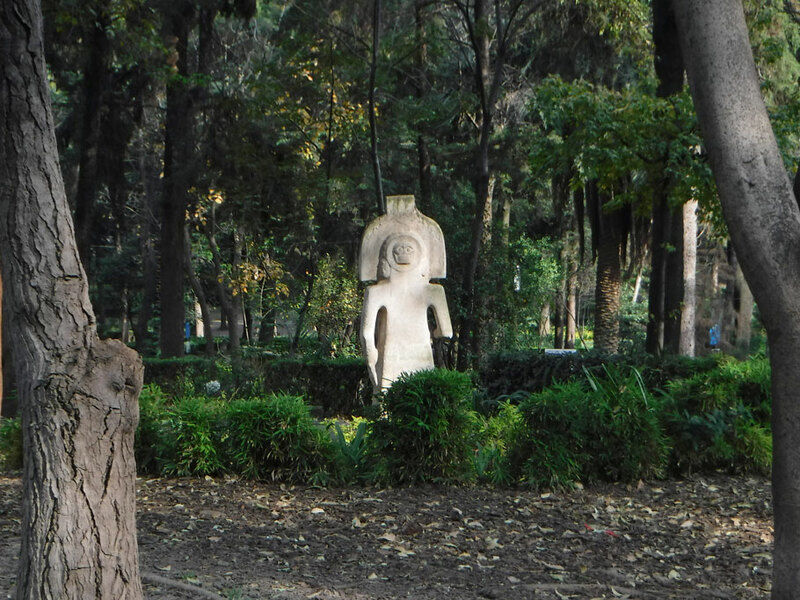 Parque Hundido has many replicas of pre-hispanic figures along the excercise trails. Facade of San Juan Bautista in the Coyoacán neighborhood. 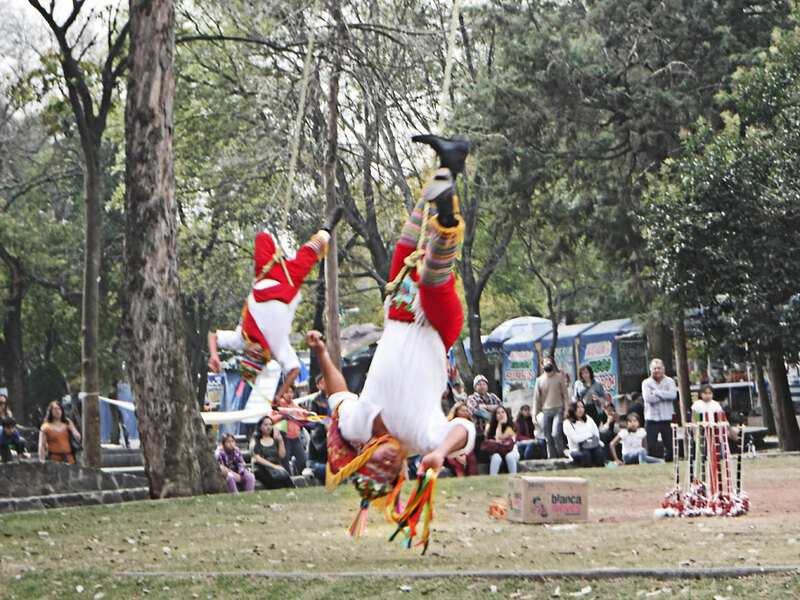 Voladores outside the Museum of Anthropology. 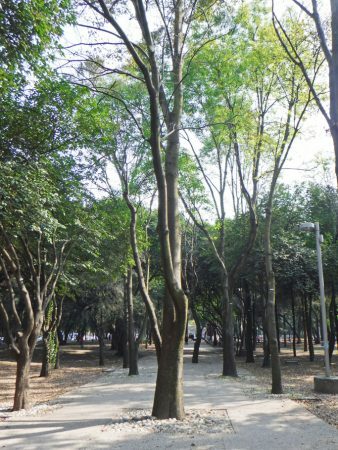 As we have seen in other parts of Mexico sidewalks, roads and walls work with the existing trees and other plant life. 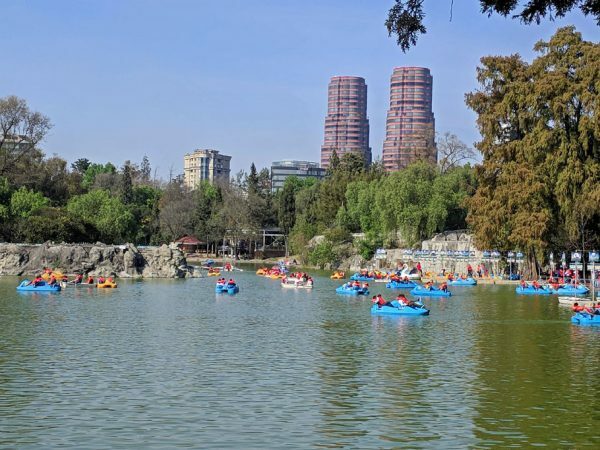 Weekenders enjoy a lake in Bosque Chapultepec. This urban forest is almost twice the size of Central Park in NY. Ciudad de Mexico letters near a lake in Bosque Chapultepec. 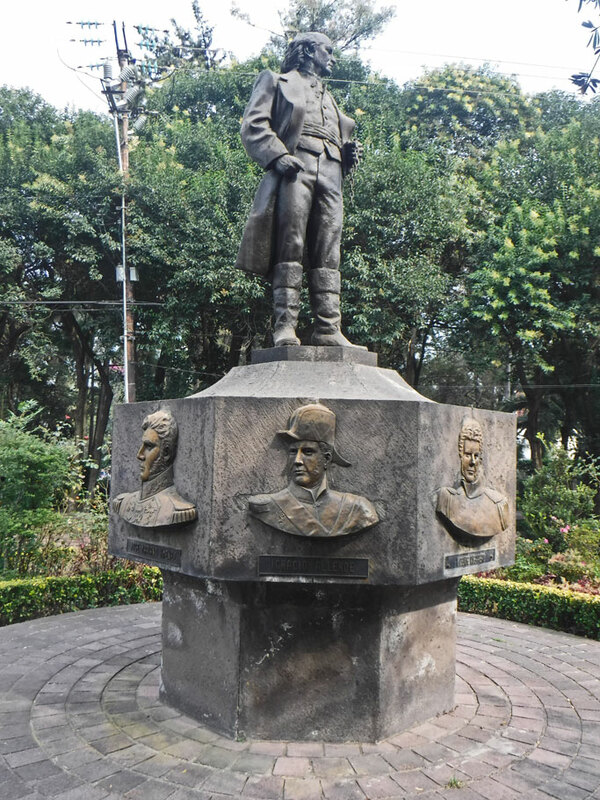 Monument to Los Niños Heroes in Bosque de Chapultepec. As U.S. forces closed in on the castle in the background during the war with Mexico, six cadets leapt to their death rather than surrendering. This outdoor listening area in Bosque de Chapultepec is a place to escape the nearby street noise. Different recorded music is played each day. Today is soft jazz. Palm reader engages the crowd in Bosque de Chapultepec. 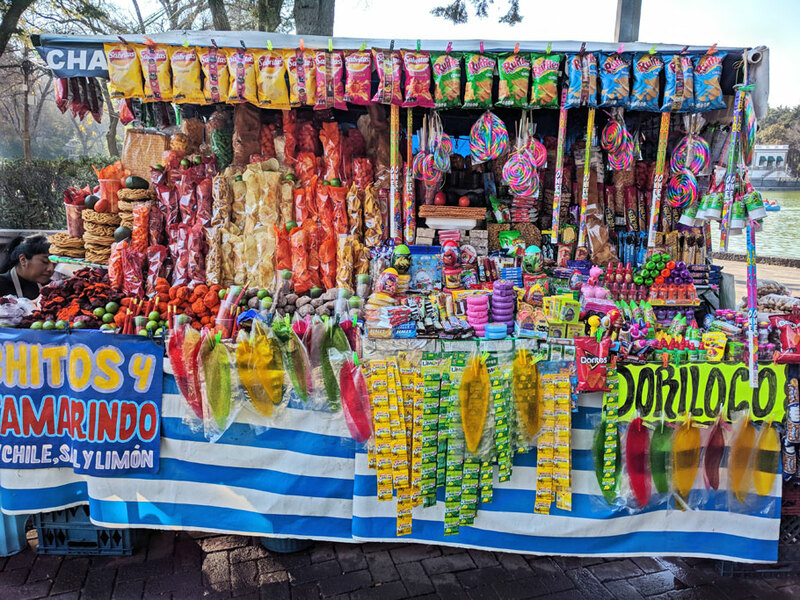 Typical snack stand in a park. Ask for the Dorilocos! The vendor will slice open a bag of Doritos, pour in a mixture of onion, carrot, and jicama chunks, then cover with a hot salsa (ingredients differ). 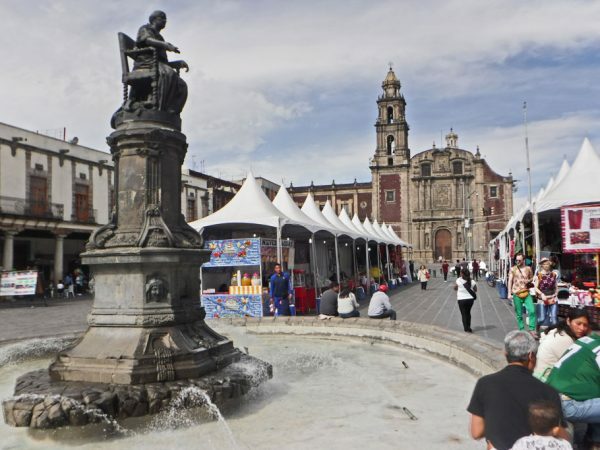 Eat with your fingers, then spend five pesos to clean up in a baño. 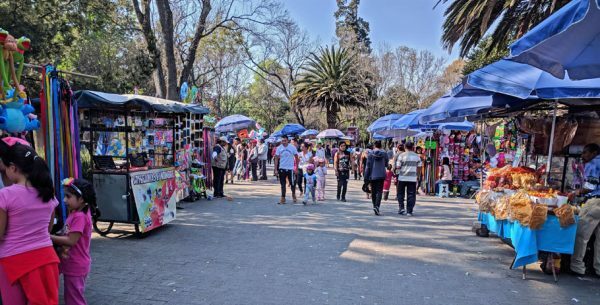 Street vendors in Bosque de Chapultepec. 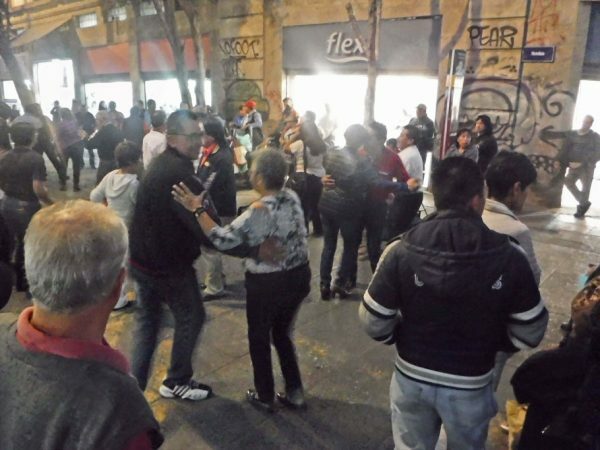 Street band gets pedestrians dancing. 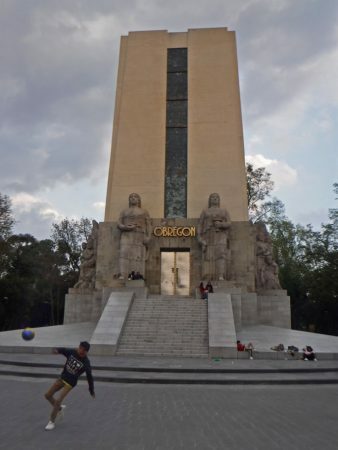 Obregon monument in Parque Acacias. Our closest Metro entrance. The first Metro line opened in 1969. There are now 12 lines serving 195 stations with 140 miles of track. Average daily boardings are 4.6M. 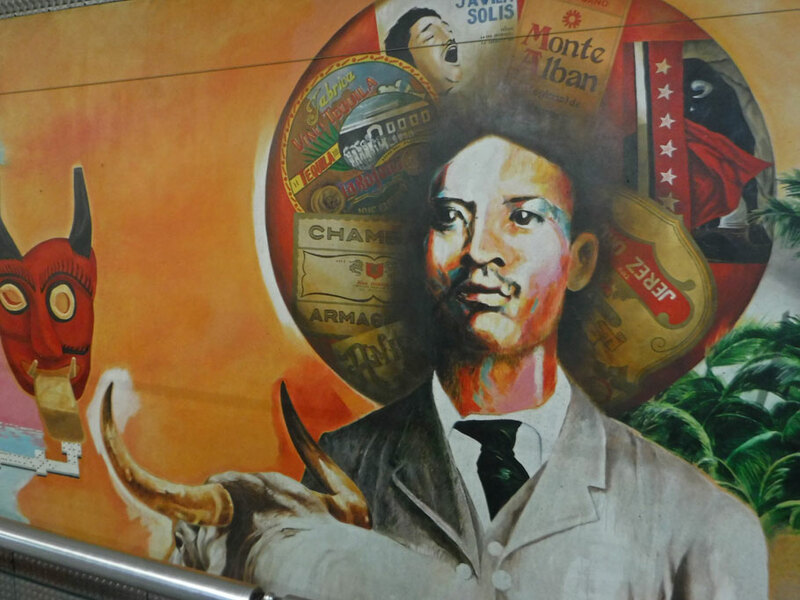 Some art from inside the Metro. On our way home from the Metro there were always some last minute eating options. 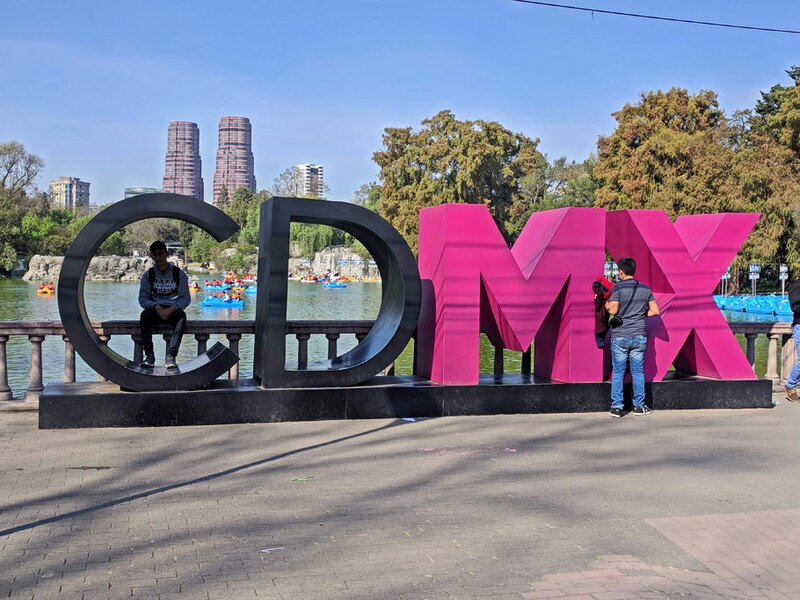 This entry was posted in Mexico, Mexico City, Travel On The Dirt and tagged CDMX, Mexico, Mexico City, Mexico City Zocalo. Bookmark the permalink. Beautiful! Truly a Magical City! I certainly agree with you that one needs at least a couple of weeks to see this massive yet impressive city! You had a good reason to stop and visit and I’m glad you found a decent base for your explorations. I’m glad we got a chance to go. 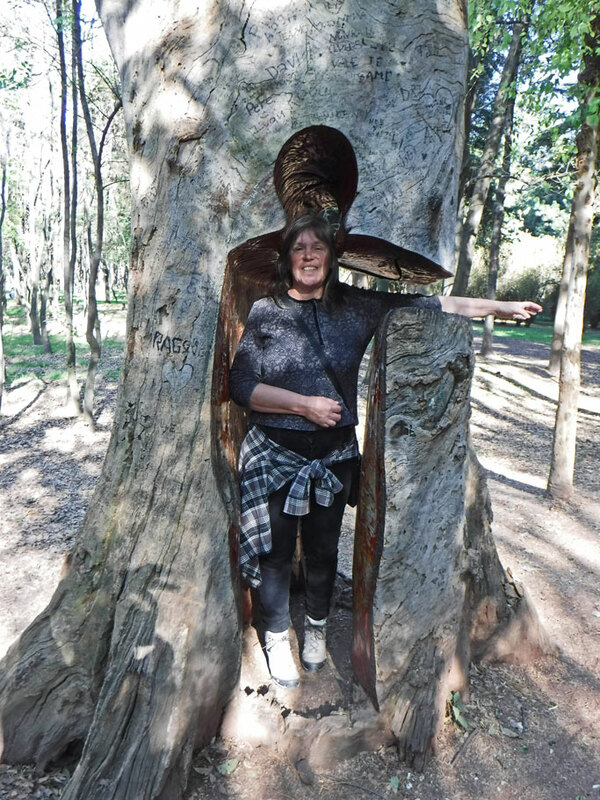 If we visit again we might not bring the van. It would have been nice to be in one of the trendier neighborhoods where we didn’t have to travel so far every day to get where it was “happening.” But we did luck out with a great location next to the subway. I am so glad Wayne got you to visit CDMX. Can’t imagine skipping it. 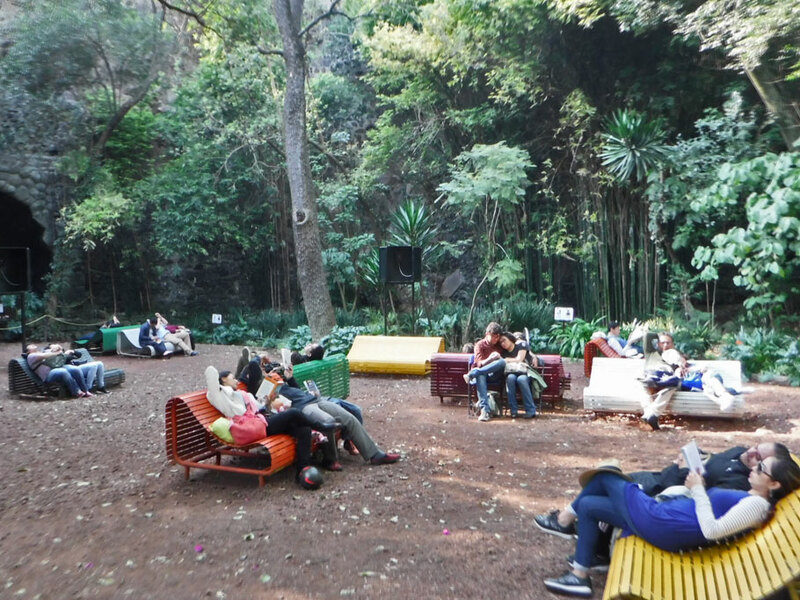 You captured the vibes in your photos! Thanks for sharing. Thanks. 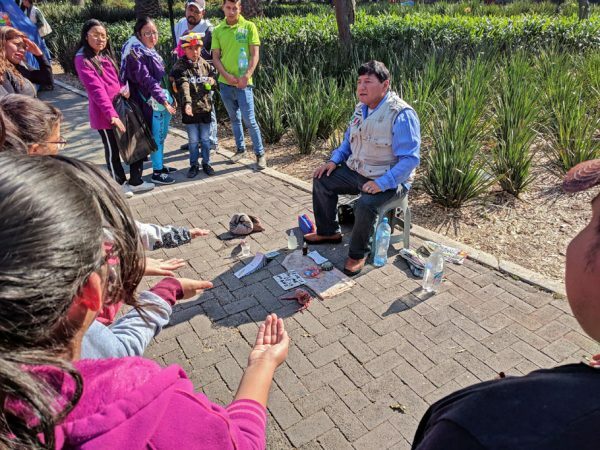 I really think it is so hard to catch the give in Mexico with photos. 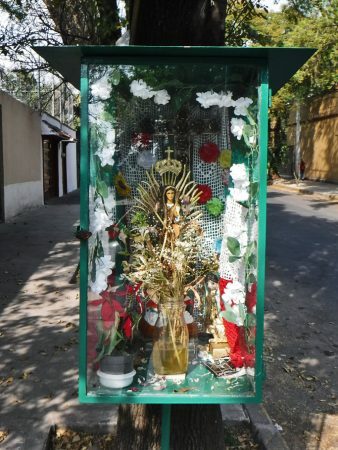 I keep thinking there is no was to show or to really explain Mexico to people. We are glad Wayne had this idea too!